Ferentillo, placed at 252 metres above sea level, is situated along the Valnerina valley at 17 kilometres' distance from the city of Terni. The castle of Precetto on the left- hand side and the castle of Matterella on the right with their bastions still seem to protect the town which is to be found behind them, below the mountains of Sant'Angelo and Gabbio from which the castles rise up. The name of Ferentillo is due to the expression: "those of Ferento" (Ferentum illi). In fact, in 742, King Liutprando, at that time battling with the Duke of Spoleto, took with him the the settlers and the warriors of the city of Ferentillo, therefore "Ferentumilli". Apart from the rocks of which we have already spoken, at Ferentillo a great part of the medieval town walls, which were erected to defend the valley, still remain. Inside the town itself, the church of St. Stefano, dating back to the 15th century, is noteworthy. A visitor on entering the crypta dating back to the 4th century remains incredulous at the sight of not only arches and frescoes of the 16th century, but at the unreal spectacle of the Mummified Bodies, which, in some cases, have preserved hair, teath and clothes, and which, in others, show the cause of death. The mummies were discovered when the bodies buried inside the church were exhumated due to the edict of Sant Claud. Afterwards, the process of mummification was studied for a long time, without, however, arriving at a definite conclusion. Scientists speak of a mixture of vaious salts and ammonia, which, added to ventilation and the decomposition of micoorganisms, has slowly dried up the skin of the corpses. The Abbey of San Pietro in Valle, dating back to the 9th century, with its noteworthy frescoes of the 12th and 013th centuries, absolutely should not be missed. Every year from 1918 onwards, during the last week of August, a show takes place in the town which recounts the history of Ferentillo with living tableaux which are to be found in the medieval part of the town. 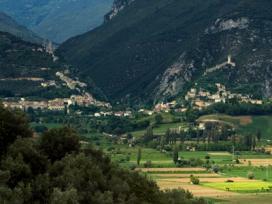 Ferentillo is also internationally famous for its Free Climbing. Its rock gymnasium can be used all around the year.